Pre Electric Shave Products: Should You Use One? Any noticeable improvements to the closeness and comfort of the shave are more than welcome for anyone using an electric shaver. Pre shave lotions and powders promise just that and many users seem to swear by them. In this article we’ll take a look at how they work, the different types of products and if they really make a difference and are worth buying. How do pre electric shaves work? When using an electric razor for dry shaving, there a few factors that can make this task even more difficult and uncomfortable: the moisture and oils of the skin, flat-lying hairs, flaky skin—to name just a few. To make matters worse, dry shaving involves constantly rubbing a piece of metal over your skin that can also get hot and cause painful razor burn. A pre-electric shave is formulated to address precisely these issues and thus provide a more comfortable and close shave. Ideally, a product like this works by providing a layer of lubrication, absorbing the moisture, toning the skin and causing the hairs to stand straight, making it easier for the shaver to capture and cut them. The end result should be a closer, faster shave with less irritation and discomfort. The most popular ones come in the form of a lotion/splash, gel or powder, each with its own pros and cons. As it’s the case with most personal care products, choosing one over another is mostly a matter of personal preference. A powder/talc pre shave provides the most lubrication of all three, allowing the shaver to glide over the skin with less friction. It is also very efficient at dealing with oily skin and absorbing any kind of moisture. Since it doesn’t contain alcohol, it doesn’t dry the skin and it’s perfectly suitable for very sensitive skin. A downside of this type of products is that they can be a little messy to apply compared to a gel or splash. On the bright side, a pre shave talc stick will last for months, offering great value for money. An excellent pre shave powder is the Remington Face Saver; manufactured in Switzerland, it has been around for a few decades and has gained a great reputation among electric shaving enthusiasts. To apply, you just rub the stick across your face and work it with your fingers into the beard. You can then proceed to shave as usual. Please note that talcum is mineral-based and could contribute to a premature wear of the blades. However, it’s difficult to say with certainty just how much the use of one will impact the lifespan of the cutters. A pre electric lotion or gel will usually include alcohol in the ingredient list, so you should definitely take this into consideration if you have very sensitive skin or suffer from any type of irritation from alcohol. Other than that, a pre-shave lotion does a great job of lifting the hairs, prepping the skin and providing a protective layer of lubrication. They’re also easier and less messy to apply compared to powders. After the shave, make sure to rinse your face and also thoroughly clean your razor; using a pre electric lotion or gel tends to make the hairs stick to the cutters. What are some of the best pre electric shave lotions? This one is by far my personal favorite. It works the best out of everything I’ve tried so far, allowing a perfectly smooth and very close dry shave. It is alcohol-based, however this didn’t cause me any problems, even though I do have sensitive skin. Unlike most other pre-shave lotions out there, the one from Speick doesn’t have that oily texture that tends to stay even after rinsing your face with water. The scent is spicy and unoffensive and it goes away completely after a short time. I’ve been very impressed by the quality of Speick products and this pre-shave doesn’t disappoint. I highly recommend you to give it a try. Williams Lectric Shave is a very popular electric pre shave lotion that’s been around since the 50’s. It improves the closeness of the shave and reduces irritation, especially on sensitive areas like the neck. Be careful when applying it though; being very runny, it tends to slip between your fingers if you are a bit heavy handed. I personally find Lectric Shave to work really well, especially when it comes to closeness. The only downside is that to me it seems quite oily. Despite that it won’t however clog your razor. The scent is also up for debate. While I don’t think it’s offensive, some may find it off-putting or a bit too old-fashioned. You can check out this post for more details on my experience with Williams Lectric Shave. Another popular option is a pre electric shave gel like Afta by Mennen. This gel is very easy to apply due to its thicker consistency. It dries the moisture of your skin, improves the glide of the razor over the skin and causes the hairs to stand up. The result is a smoother, closer and faster shave. This product is definitely easier to apply compared to the lotions above and also dries faster. I am personally not a fan of the Afta pre-electric because it tends to gunk up once it dries on the skin. And then there’s the fragrance. I don’t particularly care for it as to me it seems a bit too old-fashioned and tends to linger on for a while even after washing your face. Other than these two issues it seems to improve both the closeness and the comfort of the shave, even though the one from Williams has the edge in my opinion. 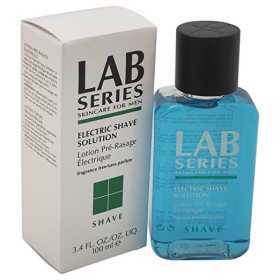 This pre-shave from Lab Series includes a lot of quality ingredients and it’s the only one on this list that is fragrance-free. So if you have any kind of perfume sensitivity you should really consider this one. 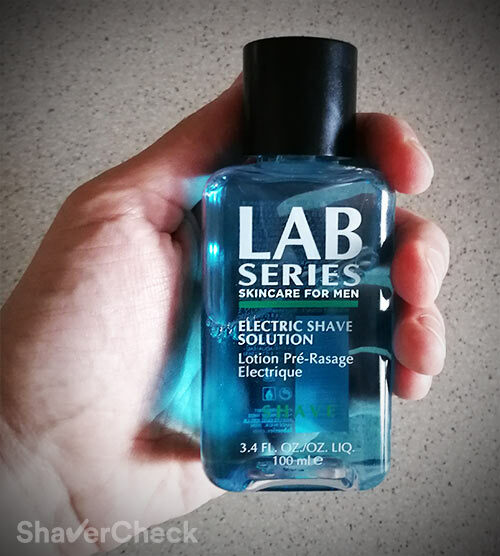 The Lab Series pre-shave works really well, being pretty much on par with the Williams Lectric Shave. However, it also has that oily texture and costs significantly more than the Lectric Shave. For this reason I actually recommend you to opt for the latter if you don’t need a fragrance-free pre-shave lotion. For more details you can check out my review of the Lab Series. 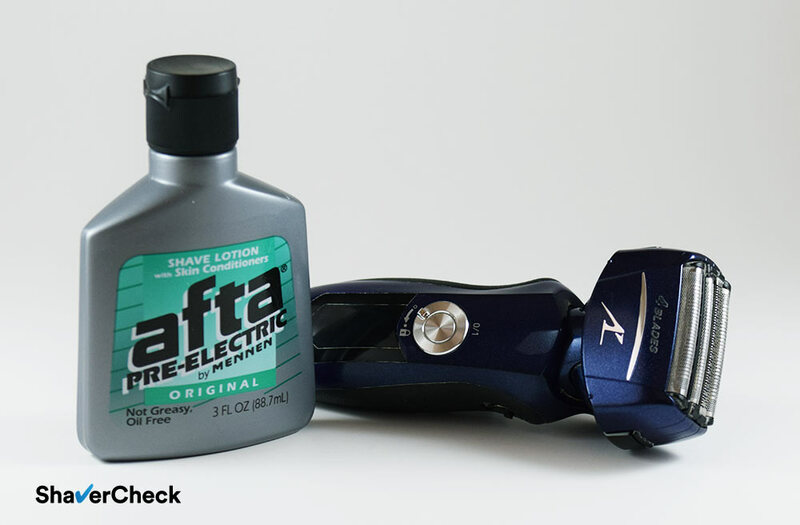 Should you use a pre electric shave product? In my opinion, you should at least give it a try. Including an electric pre shave lotion or powder is, at least in theory, one of the simplest ways to significantly improve your dry shave. Having said that, the improvement will vary and you may not see a noticeable difference, especially if you’re not affected by some of the issues described in this article. If that’s the case, you can probably skip it. However, most men will benefit from using one and pre electric products are generally inexpensive, readily available and will also last for a long time. Including one as part of your pre shave routine can have a major impact on the overall shaving experience. 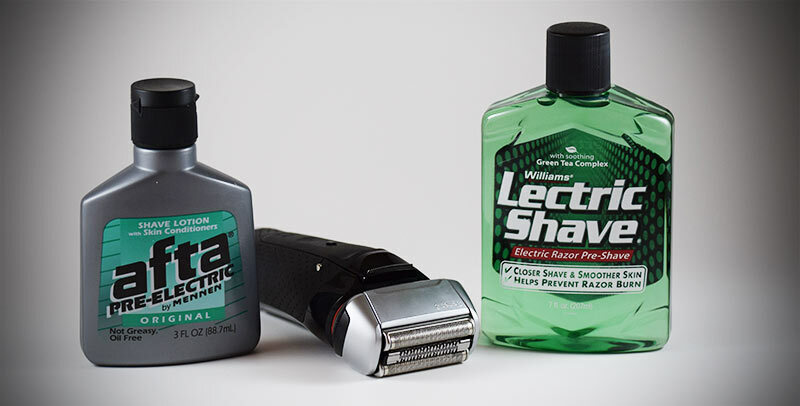 Home » Articles & Guides » Tips » Pre Electric Shave Products: Should You Use One? Where do i find the pre electric shave. I already tried about ten shops. online shops like Amazon.com have a variety of pre-electric shavers. Whats better? Dry or wet shave? Is a wet with foam better than a dry with powder? I have used a Norelco electric razor on and off for many years. Every now and then I get tired of the electric and use a disposable in the shower. A disposable shaves much closer. However, the Norelco does a decent job. I have tried it all with electric razors — Face Saver stick power (a Remington product), talcum powder, Williams Lectric Shave, Purell, before shower dry with no prep, in the shower wet, in the shower with shave gel, and after shower clean with no prep. 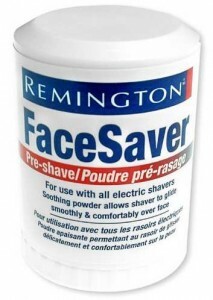 The Remington Face Saver works by far the best for me (closest shave and least amount of irritation). It’s a bit messy, but not messy like the problem of using talcum powder. Lectric Shave does a nice job of providing a close shave, but leaves one’s hands feeling greasy. Purell (yes, Purell — the hand sanitizer) does a good job of prep and works fine for me in setting the beard whiskers up. I can imagine that some will not like that much alcohol on their faces. Overall, the Purell is the most convenient for me, but I can’t use it when the humidity is too low, as it dries my skin too much. In the shower wet is not smooth for me or my face, so the razor ‘hops.’ In the shower with shaving gel works fine for a close shave and everywhere except for leaving my neck raw and stinging (maybe too close). After the shower clean with no other prep the razor seems to drag. Hope this helps. The Face Saver Stick Power (a super old school product that I remember from the ’60s or ’70s) is available through Amazon or eBay in lots of about 6 for $25 or so. Each stick lasts a month or so. Wow! Thank You for the shaving wisdom. Anyone that has been shaving that long definitely knows their stuff. I obviously stumbled across this post because I was looking to see if I needed an electric shave gel and received this very helpful information. Thank you for the wisdom sir! What ever happened to Old Spice pre electric? My stepfather used to use a blue liquid pre shave back in the 80-90’s that we’ve not been able to find any more. It looks a lot like the Williams Lectric shave but it was blue in a glass bottle. It had a really great easy on the nose smell. Anybody have any idea what it may have been called? I’ve been racking my brain but we can’t remember. Lol. Thx for any and all help in figuring this out. That sounds like Aquavelva and I’m pretty sure it is an aftershave.. my dad used Aquavelva almost exclusively when I was growing up and that’s exactly how it came packaged. You get Williams Lectric in blue colour also. You might be referring to Aramis Lab Series…you can find it on Amazon, where it has excellent reviews. Hope this helps. Did u mean Aqua Velva? It was Williams Electric shave ultra. The Williams Electric shave ultra was great and better than the currently available Williams Electric shave. I believe they stopped making the ultra years ago. 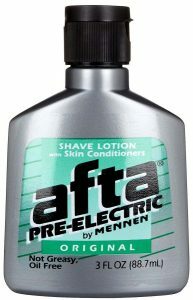 For the Afta, the amazon product to which you link is “After Shave Skin Conditioner.” Is this the same thing as a pre-shave? I ask because the picture on the amazon site is different from the one on this site says “Shave Lotion with Skin Conditioner,” as opposed to what the amazon product says. Thanks for the heads up, Brandon. I updated the link with the correct product. The aftershave conditioner is a different product, not to be used as a pre-shave. About Sterling’s Shaving Lubricator: What are the ingredients and what are the directions for use? Just to make sure there are no confusions, Sterling’s Shaving Lubricator is a product intended for your electric razor, it’s not a pre-shave like Lectric Shave for example. Regarding your question, I’m afraid I cannot help you since I didn’t get the chance to try it yet. Just got a new Panasonic shaver—with a “sonic vibration” cleaning mode—and noticed that the manual makes no mention of using a pre-shave. I have been using Lectric Shave (or house-brand equivalents) for decades, but when I asked Panasonic customer support, I was told that they recommend against using a pre-shave. Maybe I should call back and press for more details, but do you think they have a point, and if so, what do you think it is? Maybe something about the cleaning mode not working as well? The addition of a pre-shave lotion like Lectric Shave or any other brand shouldn’t affect the performance of your Panasonic shaver. I can only think of mineral based pre-shave powders that can actually lead to a premature wear of the blades. I almost always use a pre-shave lotion when I shave dry and never had any issues with my Panasonic razors. Just make sure to clean it thoroughly after every use with some liquid soap to remove any residues. I have norelco 9000 series, and I used Remington face savor power stick and it made my norelco 9000 series blade dull. I am sure about that. Few years ago,I had used Johnson baby pawoder as a preshave and it also did dull my norelco blade. So . Minerals like Remington face savor power stick will dull any rotary electric shaver. Thank you for taking the time to share your experience — that pretty much confirms it. I prefer lotions over powder sticks and have rarely used one. Who really cares if it smells old fashioned? You can smell a bit more timeless then, as well as classy! Well, some actually do care and I always try to cover everything that may be important. Fragrance is a tricky one, I’ll admit that. I have good results with just using alchol! Wet your face, let it dry, hairs stand up, then use Panasonic ARC 5! Very close shave! My son is autistic and has a terrible time tolerating alcohol-based odors. We will try the Face Saver stick! That’s probably the best option since pretty much all pre-shave lotion/gels are alcohol-based. Thank you for sharing….I am a woman…I have been shaving my head for approximately one month with the Wahl Shaver and Shaper. Overall I am pleased, but I would like a closer shave in the back behind my ears and on my neck. Question, are the pre-shave dry options for the head as well as a he face. Thank you for your comment. Theoretically, you could use a pre-shave when shaving your head, but be wary that the scalp is very sensitive and susceptible to some unpleasant reactions. I would personally advise against using a pre-shave directly on the scalp, be it talcum or an alcohol-based lotion. You could give it a try and see how it goes, but only apply the product on a very small area at first and see how it goes. You can safely use a pre-shave on your neck though. Shaving oils and creams are usually used for shaving the head, but those also imply the use of a razor blade, not an electric shaver. I’ve been using the Face Saver on my face, the back of my neck, and my scalp for quite a few years with no adverse reactions. It especially helps reduce the shaving irritation to the back of my neck. Awesome, Greg! Thank you for taking the time to share this. Will any of the pre-shave lotions or sticks help keep the razor foil and cutters sharp. A pre-shave will have an insignificant effect as a lubricant. Alcohol-based splashes evaporate within seconds and some sticks that are mineral-based can actually accelerate the wear. The only option that actually works is to use a light lubricant (clipper oil, sewing machine oil) or a special spray lubricant like the Remington Shaver Saver. Thanks Ovidiu for the input on keeping my electric shaver foil and blades in the best condition. I havn’t seen any reference to And is Cool Care Plus clippers spray. It contains lubticant, disinfectant, cleaner and rust preventative. My friend uses it on his Panasonic Arc 5. He also uses navy oil to lubricate the razor. I think his thinking is in left field.
. He says And is primarily used for hair clippers. I use your Remington product. You comment would would be appreciated. Haven’t had the chance to try the Andis spray yet, but I’ve heard great things about it and it should work perfectly fine with electric shavers too. I usually recommend products that I’ve actually used, but there are of course other excellent alternatives as well. Thanks for the comment, Charles. I really appreciate it. Would these pre electric products be effective to use with a stubble trimmer? More so for lifting the hairs, since stubble trimmers are not designed for a close shave? I use the Conair i-stubble flexhead trimmer (0.02mm setting for cheek and neck lines and 0.04mm for the rest). You can definitely try using one, although I cannot say anything about their effectiveness when used with a stubble trimmer. As I said in the post, I would choose the pre-shave from Speick mainly because it’s not oily and it seems to work better than the rest. The scent is also better compared to Lectric Shave which is by far the most popular pre-shave in this list. It’s worth a try. 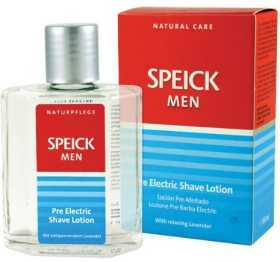 I’m definitely going to try the pre electric shave lotion from Speick. I’ll probably get most of the benefit on my cheek and neck line areas where I use the 0.02mm base blade. I recently purchased a Braun Series 9 razor with a cleaning unit. It states that you should get 30 cleaning cycles from one cleaning cartridge, but I only seem to 14-16 cycles from a cartridge. Is there a reason for this? Excessive hair strands and the evaporation of the cleaning fluid are likely the most important causes of this. I wrote a detailed guide on how to make the Braun cleaning refills last longer. Appreciate your reviews on this and electric razors. I’ve been using electric shavers for over 50 years and always have problems with getting my neck shaved cleanly. Most recently I’ve been using a Braun 9 series but still not happy with the neck. Based on your review of shavers picked up the Norelco 8900. It does a better job but it caused some irritation which is something that has happened to me before with Norelco. I picked up the Speick lotion and am happy with it. Plus I seem to get a decent shave with the Braun using it. Wish the Norelco had worked but I think it’s going back since the lotion didn’t prevent the irritation. One question on the lotion, is there a secret to pouring it so it doesn’t run down the bottle? Thanks for your comment, I really appreciate it. Glad to hear the Speick lotion is working well. Regarding the pouring problem, it has happened to me as well. Here’s what to do to minimize the amount of liquid running down the bottle: once you’ve poured the desired quantity of product in your palm, rotate the bottle just to the point where the liquid stops pouring (the bottle will be in an almost horizontal position), while still holding it above your hand for a few seconds. This will allow any drops to fall in your palm instead of dripping down the bottle. After that rotate in an upright position and place it on the countertop. Both AFTA and Lectric Shave smell like 1950. I’d venture to say that no one in the age bracket these scents would appeal to actual uses an electric razor. They both work, but the scent renders then unusable. I agree, none of them are particularly appealing. The only pre-shave I have found so far that actually has a pleasant fragrance is called Freelette (and works quite well too). It’s a pre-shave lotion, so its consistency is a lot thicker compared to Lectric Shave. I really like this website. It has loads of information and several tips on daily shaving. The question I have is this: Will the liquid pre-shave products harm the Braun series 9 cleaning station solution? I know the liquids contain alcohol and small amounts of oil. With my previous Norelco shaver, I used a liquid pre-shave but it didn’t have a cleaning station. Thank you for your comment, I really appreciate it. That won’t be a problem — alcohol-based pre-shaves evaporate extremely fast and won’t leave any residues on your shaver. I read your Pre Electric Shave Products article last year (April 2018) when I was wondering what products might be available. I’ve used Remington Face Saver on-&-off over the last few decades, but my latest razor seemed to be less effective with it. Your article reminded me that I never liked Williams Lectric Shave because of its inherent oiliness. However, your comments about the possibility of Face Saver causing accelerated blade wear seemed logical to me, and an ‘oily’ pre-shave might work better with this shaver. I switched soon after this realization. My usual routine was to apply Face Saver, shave, run the shaver in a rubbing alcohol cleaner/bath, then apply shaver oil to the blades. Using Lectric Shave allows me to skip the blade oiling, and the blades seem to be staying sharper between changes (so far). Thanks for these great write-ups! Thank you for taking the time to share your experience. Those are some very interesting and useful insights. Since I wrote this article I came across another excellent pre-shave balm called Freelette. If you can get it, I recommend giving it a try. It’s very moisturizing and oily as well, but in my case it worked better than Lectric Shave and it smells great too. My 25 yr old son and I each have a Braun Series 9 and are very pleased with the shave. He has very sensitive and oily skin with prior acne problems and has been getting razor burn, ingrown hairs and bumps (as he usually does with shaving). 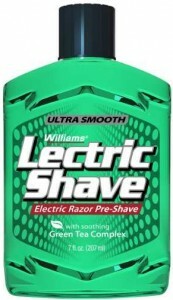 I bought some Williams Lectric shave pre shave and it did give us a better shave however it didn’t help his problem. Also I read that the isopropyl myristate in the Lectric Shave eventually causes pores to clog up. I then bought some Shave Secret pre shave and found the closeness of the shave to be quite inferior along with the difficulty of experimenting with water amount and the proper amount of drops in an unsuccessful attempt to effectively lubricate the beard. I have just bought Dickinsons witch hazel and Thayers witch hazel as well as Nivea sensitive post shave balm as after shaves to see if that will help. We both like the improved shave using the Lectric Shave pre shave and I have no difficulty with it but he is looking for a different brand of pre shave to use in conjuction with our new after shave experiments. Can you help with some ideas? Thank you for your comment. I would give Lab Series a try since it’s fragrance-free and would seem like a better option in this situation. Also the pre-shave from Speick is one that I often recommend and it’s superior to Lectric Shave in pretty much all regards. The blue liquid inquired about above may have been Mennen’s Skin Bracer Pre-Electric Shave Lotion. It is/was greasier than Lectric Shave. I just bought the Panasonic Arc 5. I seem to get the best shave using Witch Hazel as a pre shave with a 14 % alcohol content. At the end of my shave I use Thayers Witch Hazel. This combination seems to work very well, giving me a close comfortable shave, with no irritation or scent. Has any one else tried this way of shaving? Thank you for your comment, Stuart. I personally haven’t tried Witch Hazel as a pre-shave, but I’ll definitely give it a go. Thank you for the suggestion, Bob. I tried to find it here in Europe but with no success so far. And Amazon won’t ship it overseas, so I’m out of luck for now. Lectric shave is a great product with a bad smell. I have tried many others and for me this one is the best. BUT it stinks. Price is great too. You pretty much nailed it, Arie. Thank you for your comment. Thank you for your comment, Sam. I also feel the same with regards to Afta and I gave up on using it completely as it had a tendency to gunk up my shavers. 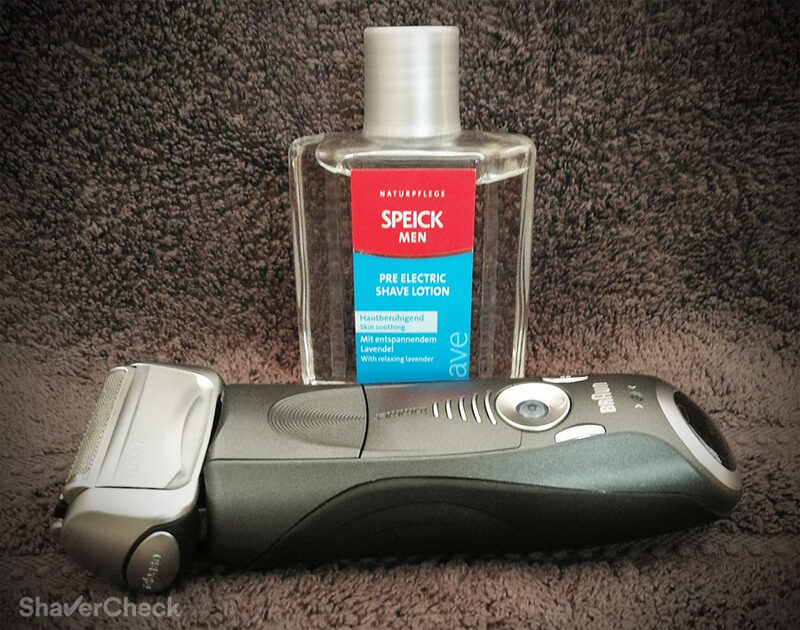 I use the Speick pre-shave most of the time, it has a spicy scent that I don’t particularly love, but it’s definitely better compared to Afta or Lectric Shave. However, I do find its performance to be the best out of all the popular brands, so it makes up for any shortcomings. If you have the chance give it a try.